You can record on 12 tracks but, you can bounce tracks without loss of quality so, the potential is unlimited. Each of the BR-1200CD audio tracks provides 16 VTracks (or virtual tracks), allowing you to record as many as 192 (12 x 16) different performances. You can playback 12 tracks at the same time with individual compression and EQ. 8 tracks are for mono recording and 4 tracks have stereo recording capabilities. The Boss BR1200 has 2 individual XLR inputs with phantom power and a TRS input for guitar or bass. The transport controls and mixer faders are the same as tape recorder and mixer so if you are use to using these you will be right at home with the BR-1200CD. The BR-1200CD provides you with a full range of powerful effects. Insert Effects are used during recording, Loop Effects work like standard send/return effects, which include spatial effects such as chorus, delay and reverb. the ability to fix incorrect pitches in recorded vocal performances and to automatically apply vocal harmonies to your vocal tracks. All is needed for professional-level music recording, such as, the editing of recorded performances, track bouncing, applying effects, and the mix-down can be carried out completely within the digital domain, with, no loss of quality. The BR-1200cd records and plays back at a sampling rate of 44.1 kHz and, a bit depth of 16 bits. Record guitar,vocals,piano or any other instrument then, add effects, mix and master, create a drum track, and then burn onto CD or transfer to your computer using the usb port. This unit makes doing all of this very easy. This is a high quality unit just like you would expect from Boss. Very durable so can be used for live recordings. This is a high quality recorder with effects and amp models that are some of the best. In my view it has studio quality sound which help you create studio quality recordings. The only down side is the drum sound, I feel the software programs for creating drum tracks have the edge. Considering what this unit is capable of doing it is very easy to learn and the manuals is very well written and easy to understand. 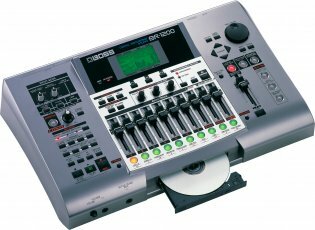 There isn't many units that compare in quality and value to this unit although if you don't need 12 tracks the Boss BR900 or Boss BR600 might be better value. I would rate this very high and only let down by the drum sounds. Not that the drums are bad, it is just when I compared it to dedicated drum machines like the Zoom RT223 Rhythm Trak Drum Machine or software drum programs like Toontrack Superior Drummer Software. So overall, if you are looking for a unit that will do it all, from recording to burning a cd of your recordings you will be more than happy if you buy the Boss Br1200.